We posted here yesterday about the Tampa Tribune article targeting citizens who had alternative ideas about how to fund our roads and transportation without another 30 year huge sales tax hike. The Tribune was so concerned about who spoke to who about the transportation issue when we've been advocating for the commissioners to consider a Plan B for a long time. Ironically the Tribune's own editorial today Give cities transportation keys basically admits the crony Go Hillsborough county sales tax hike proposal will fail. So guess what they did? The Tribune editorialized for their Plan B - allow the City of Tampa to hold their own municipal referendum for a transportation sales tax hike. A simple measure would defuse much of the conflict over local transportation tax proposals that frequently pit suburban areas against urban ones. …the state should allow municipalities to hold a referendum on a transportation sales tax. Will the county be protected from backstopping any city transportation boondoggles gone awry? Will this result in more transportation bureaucracy in Tampa, which now must coordinate with HART, MPO, TBARTA, TED/PLG, TMLA, THEA, planning commissions, FDOT, just to name a few? The Tribune states the 2010 rail referendum passed in the city of Tampa. We'll clarify that statement. 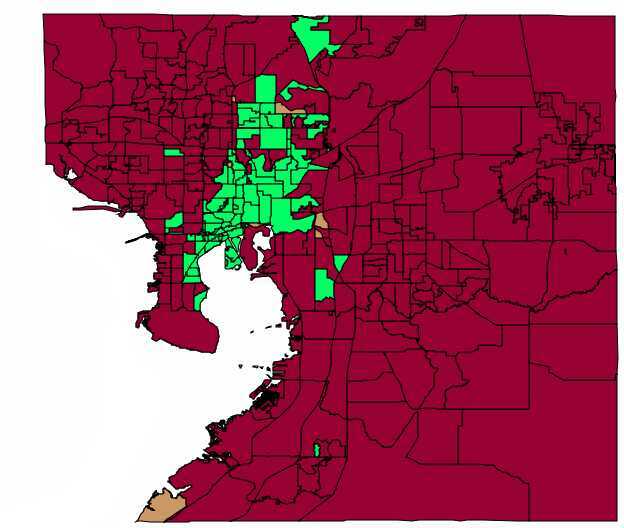 The 2010 rail referendum passed in the urban precincts of the city of Tampa mainly along where the rail corridors were planned. The Tribune conveniently left out that Greenlight Pinellas failed last year countywide in Pinellas and in St. Petersburg too. Where's the Tribune reporters when you need them? The Tribune can publish their Plan B and no one questions who the Tribune spoke to about their idea. But others bring forth a Plan B and the Tribune is compelled to target them. The Big Squeeze in the Big Guava?